Pissarro moved from Pontoise to Éragny-sur-Epte in 1884 and remained there for the rest of his life. The village was smaller and less modernised than Pontoise. 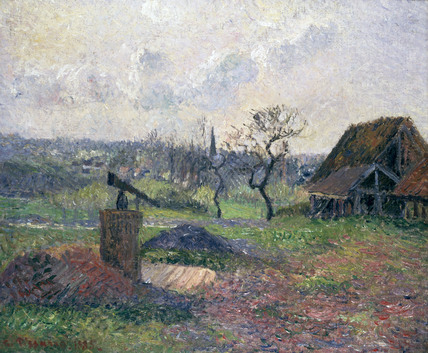 The brick kiln, owned by M. Delafolie, could be seen from the Pissarro's home. It had almost fallen into disuse. The water pump stands forlorn in the foreground and the buildings in the background are overgrown. The short brush-strokes anticipate Pissarro's interest in Pointillism.